hi i have had my roxio for about a month now and all was working fine. untill my file changes from .dmsm files! I know they are not proper files and can't upload to youtube but i want to know how to prevent the .dmsm files? is my capture card broke? is there a way to fix it? The .dmsm files are the files created by Videowave when you edit your video file. It's not actual video, as you've observed, it's the information about the edit's you've made to whatever video files you're working with. So, let's say you've created a project, and added an opening color panel with some text, then added a clip called, MyBestRun.m2ts, and you've applied a transition between them, and then faded it out at the end. And then you saved the project and named it, "I_did_it". Videowave creates a file called, "I_did_it.dmsm" which has all the information about adding the color panel, the duration of that panel, the transition, etc. so that when you re-open the project, it's all set. It hasn't changed your original video file at all. If you want to upload a video that includes all of your edits, you have to open the project, then "Export to" and select a video format and name. Then you'll watch as videowave creates a new video file that includes all of your edits, and the final video output will be what you'd upload to youtube. So, are you having a problem editing your videos? Or capturing? I'm not sure from what you've posted exactly what the problem is. We need more information about exactly what you're doing, and what's different now than it used to be. How large are these .dmsm files? I think you need to double check the path you have set for your capture folder. I've a suspicion that may have gotten changed. You should find your capture video files there. I still don't understand what problem you are having. The program does not "make" dmsm files unless you tell it to save the project you are working on. Did you read Dave's post above where he explained what dmsm files are? They are not video files. What happens if you double-click on one of those dmsm files? Explain exactly what you are doing. RGC captures ONLY as m2ts file. If you have SP2 and choose MP4 it will first capture as m2ts and convert it to mp4 when you hit Stop! That is the only way it can happen so the only possible scenario is that a couple of days ago you started hitting Save or Save As instead of the Export As you had been using. There is nothing wrong with using Save or Save As if you want to return to the Project later. But if you want a video file the only possible way to produce one from VideoWave is Export As. Okay, this is the part that we're interested in. Tell us exactly what options, menu items, buttons you're clicking to export your video. Give us explicit, excruciating detail. Every click you make, every option you select. If you want to grab screen captures and attach them to your post, that would be even better, especially the error message. Nothing to see??? there it is! But still NO! There is nothing in Export As can produce a dmsm file. Okay, you're mixing things up. If you go back to your old projects, you're going to find all of the .dmsm files that were created. With the error you're seeing above, you're simply not getting any output file. VideoWave has always been creating the .dmsm files but you've been ignoring them. Now that you're getting the Render error, you're not finding any output .MPG (or other video format) files, and only seeing your .dmsm file. (Go look you'll find all the old .dmsm files with your old projects.) The .dmsm files aren't being created at the output/render step. 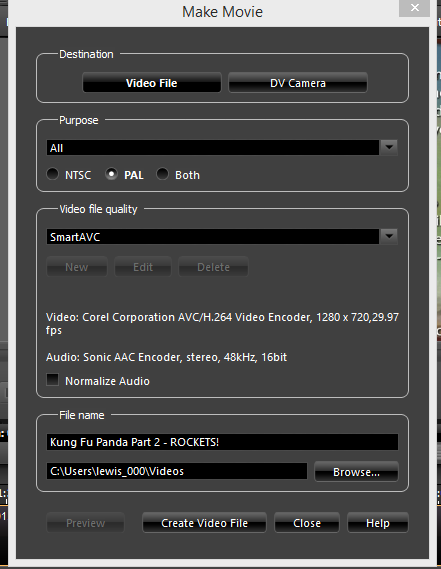 If you create a new project and save it without trying to output a video file, you'll find an associated .dmsm file. Try a different video format, or several, until you find one that works at this point. Just to see if anything can be made to work. how to change to a different video format? 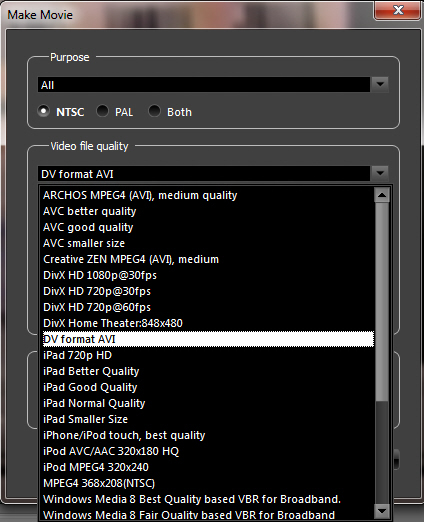 See that option in the middle, "Video File Quality"? u know when it asks do u want to save changes made to production whatever do i say yes or no? Have you made any changes to your production? If/when you say, "yes", that's when it's creating the .dmsm file. That's all the information about adding your audio, any transitions you've added... all that stuff. So, if you don't want to have to redo everything, you probably want to say "yes." thanks a lot it works! :D u were big help! Glad you got some "real" output! Just wondering do u guys work for roxio or just know A LOT! about the device? We volunteer our time to help out. We do have some "connections" so we can help escalate threads to those who do work for Roxio/Corel. Once in a great while you'll find someone here who actually works for Roxio/Corel, but their name will usually reflect that with a "ROX_" to start their name.